Checklists are commonly used in graphical user interfaces. Checklists are useful for applying methodology. 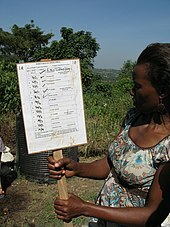 A checklist is a type of job aid used to reduce failure by compensating for potential limits of human memory and attention. It helps to ensure consistency and completeness in carrying out a task. A basic example is the "to do list". A more advanced checklist would be a schedule, which lays out tasks to be done according to time of day or other factors. A primary task in checklist is documentation of the task and auditing against the documentation. Pre-flight checklists aid in aviation safety to ensure that critical items are not overlooked. In civil litigation to deal with the complexity of discovery and motions practice. An example is the open-source litigation checklist. A popular tool for tracking sports card collections. Randomly inserted in packs, checklist cards provide information on the contents of sports card set. Checklists have been used in healthcare practice to ensure that clinical practice guidelines are followed. An example is the Surgical Safety Checklist developed for the World Health Organization and found to have a large effect on improving patient safety and subsequently found to have a nil effect in a cohort of hospitals in the Province of Ontario in Canada. According to a meta-analysis after introduction of the checklist mortality dropped by 23% and all complications by 40%, higher-quality studies are required to make the meta-analysis more robust. However, checklist use in healthcare has not always met with success and the transferability between settings has been questioned. In the UK, a study on the implementation of a checklist for provision of medical care to elderly patients admitting to hospital found that the checklist highlighted limitations with frailty assessment in acute care and motivated teams to review routine practices, but that work is needed to understand whether and how checklists can be embedded in complex multidisciplinary care. Checklists are often presented as lists with small checkboxes down the left hand side of the page. A small tick or checkmark is drawn in the box after the item has been completed. Other formats are also sometimes used. Aviation checklists generally consist of a system and an action divided by a dashed line, and lack a checkbox as they are often read aloud and are usually intended to be reused. Excessive dependence of checklists may hinder performance when dealing with a time-critical situation, for example a medical emergency or an in-flight emergency. Checklists should not be used as a replacement for common sense. Intensive training including rote-learning of checklists can help integrate use of checklists with more adaptive and flexible problem solving techniques. ^ Higgins, W. Y., and D. J. Boorman. "An analysis of the effectiveness of checklists when combined with other processes, methods and tools to reduce risk in high hazard activities." Boeing Tech J (2016). ^ Haynes A; Gawande A (January 2009). "A surgical safety checklist to reduce morbidity and mortality in a global population". New England Journal of Medicine. 360 (5): 491–499. doi:10.1056/NEJMsa0810119. PMID 19144931. ^ Urbach DR, Govindarajan A, Saskin R, Wilton AS, Baxter NN (March 2014). "Introduction of surgical safety checklists in Ontario, Canada". N. Engl. J. Med. 370 (11): 1029–38. doi:10.1056/NEJMsa1308261. PMID 24620866. ^ Bergs, J; Hellings, J; Cleemput, I; Zurel, Ö; De Troyer, V; Van Hiel, M; Demeere, JL; Claeys, D; Vandijck, D (Feb 2014). "Systematic review and meta-analysis of the effect of the World Health Organization surgical safety checklist on postoperative complications". The British Journal of Surgery. 101 (3): 150–8. doi:10.1002/bjs.9381. PMID 24469615. ^ Dixon-Woods, Mary; Leslie, Myles; Tarrant, Carolyn; Bion, Julian (20 June 2013). "Explaining Matching Michigan: an ethnographic study of a patient safety program". Implementation Science. 8 (1): 70. doi:10.1186/1748-5908-8-70. PMC 3704826. PMID 23786847. ^ Papoutsi, Chrysanthi; Poots, Alan; Clements, Jake; Wyrko, Zoe; Offord, Natalie; Reed, Julie E (5 January 2018). "Improving patient safety for older people in acute admissions: implementation of the Frailsafe checklist in 12 hospitals across the UK". Age and Ageing. 47 (2): 311–317. doi:10.1093/ageing/afx194. PMC 6016694. PMID 29315375. Look up checklist in Wiktionary, the free dictionary.